I took the Corona to my weekly solo acoustic gig last night to give it a gig test. From the moment I started playing it, I was in love with this pedal! I actually got to my gig a little early so I could play around with the settings and find a “standard” setting that I could use. My thought behind this was that the pedal would just stay on all the time, except for specific songs that I just want my raw guitar sound. My standard setting was Speed at 11am, Depth between 12 and 1, FX Level at just past noon, and Tone right in the middle. This produced a super smooth, lush, liquid, and sensual tone that also added a three-dimensional quality. It was total ear candy!!! Not only that, I was using no other processing, doing straight into the restaurant’s board and relying on the high ceiling to get my reverb. The result was absolutely stupendous! I used the “standard” setting for the songs I play fingerstyle, which is most of the time. For songs where I was strumming, I backed the depth to noon. It’s a very subtle change, but an important one, as any chorus can muddy up your tone when you’re doing fast strums. I do this with all my chorus pedals. But the interesting thing with the Corona is that when I wanted to do any kind of adjustment, I didn’t have to move the knobs nearly as much as I would with other pedals. With the Corona, all the controls are interlinked, so it only takes minute adjustments to affect the overall tone. This is totally cool! I didn’t use the TonePrint or TriChorus modes at all last night. I just didn’t feel a need to use them. 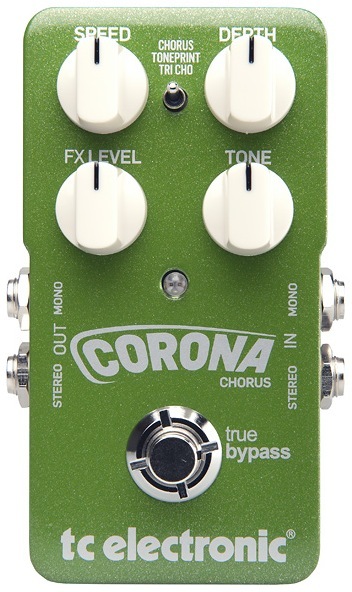 As I mentioned in my review of the pedal yesterday, if the Corona only had the standard chorus mode, I’d still buy it. It sounds that good! I could get super-subtle chorus tones to gorgeous, liquid tones ala Andy Summers with this mode. In fact, I played “Every Breath You Take” last night, and just loved the chorus sound that the Corona produced for that. Finally, a question I asked myself last night was: With how much I love the Corona, will it possibly replace my beloved Boss CE-2? Probably not. Not because the CE-2 is a better chorus, but simply because it has a distinctive tone that no other chorus I’ve every played can cop. Besides, I also like the slight gain boost that the CE-2 gives me when engaged. For bluesy stuff, that gain boost actually comes in handy. But for general chorus duties, I’ve found my go-to chorus pedal. This thing absolutely RAWKS!! !